Reissue of “4 visions”, recorded in 1979. This new edition was supervised by the band & features 4 bonus tracks. The whole tracks have been remastered by Udi Koomran from the original master tapes. New covert art too, by Thierry Moreau. A true classic of the Zeuhl genre & a masterpiece of the French 70s prog scene. A must-have! 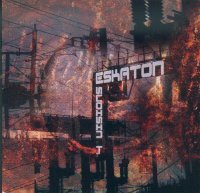 Eskaton are one of many zeuhl bands who never strayed far from the roots of Magma (who, of course, founded the genre), at least not for their debut CD, 4 Visions (later works moved towards more standard jazz-rock). All the key elements of Magma are present: the pounding, ever-insistent rhythm section, the chanted, repetitive vocals, and the Fender Rhodes piano (which was to Magma what the mellotron was to, say, King Crimson). In these respects, Eskaton are very much responsible for giving the world a lost “Magma” CD in the vein of their masterpiece MKD. However, there is a key difference between the two bands in terms of presentation. Magma wrote (and still writes) long, epic compositions in a made-up language that told a story (a story that, in fact, carried over across CDs). Eskaton, on the other hand, wrote songs that were long, yes (all songs on 4 Visions are roughly ten minutes long), but that are individual pieces, not part of some larger whole. In addition, the songs are in French, which means that, rather than existing apart from the listener (as Magma’s music did/does), 4 Visions is very much at the level of the listener. There is no aura of mystique of the type Magma commanded, but this is replaced with a down to earth, music for the people by the people mentality that is every bit as invigorating. But enough comparing and contrasting to Magma, as this music would sound just as good regardless of whether Magma ever existed. The clear highlights are “Attente” and “Ecoute”, both of which mix tremendous jams with beautiful vocals and, of course, the rhythm tandem of Andre Bernardi (bass) and Gerard Konig (drums). Those two really know how to throw down a groove, and while the vocals and keyboard may be the dominant aspect of the band’s sound, it’s the incessant grooves that hold it together. That allows this CD to actively rock while remaining beautiful (courtesy of the vocals), and it is that contrast of all-out rock and subtle beauty that makes 4 Visions such a powerful listen. 4 Visions is almost the perfect introduction to Zeuhl. It’s more accessible than Magma, but still conveys the trademark zeuhl sound, and thus those who might not enjoy (at least not at first) the general weirdness of Magma may still appreciate Eskaton. Highly recommended to both Zeuhl newcomers and Magma fanatics alike. Back in the day Eurock released this album album on cassette only. This brand new reissue has been totally re-mastered and almost 30 minutes of previously unreleased music has been added. The result is one of the best Zeuhl inspired releases I’ve heard over all these long years. The four original tracks are bone crunching and rock solid, the 4 previously unreleased tracks add spatial ambience and instrumental fireworks and the new mix fleshes the album out dynamically so it literally sounds like it was produced today. The “new” 4 VISIONS will reach out of the speakers and grab you more today than it did way back when. The band is no more, but this new reissue guarantees their musical spirit will live on!